Sharma Torres and daughter Anjelina, 6, a Royal Elementary School first-grader, give each other a hug. Turmoil in Torres' life led to a custody battle for Anjelina, but the mother and daughter were reunited, thanks largely to help from a volunteer lawyer and the Domestic Violence Action Center. It took a flight to the East Coast and help from the local police department for Sharma Torres of Honolulu to get her little girl back. But she never would have gotten that far without help from her volunteer lawyer and from the Domestic Violence Action Center. "I really believed that she had been wronged," said family law attorney Ellen Politano, who donated her time. Access to legal services not only helps ensure justice for individuals like Torres, but also is credited with helping reduce the incidence of domestic violence over the long term. 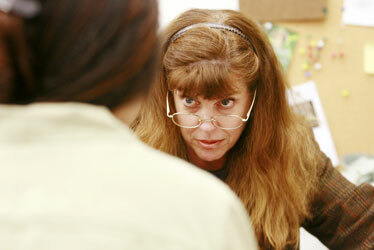 Star-Bulletin reporter Susan Essoyan explores this aspect in day two of a two-part series about getting legal help. "It's more than just writing contracts and being on retainer for the bank and going to court. It's the little people, too. These people are entitled to lawyers." Her baby girl, Anjelina, was just 6 months old when a judge ordered Sharma Torres to give her up. "I was hysterical," Torres said, breaking down in tears at the memory. "I lost my child based on a lie." A petite woman who enjoys playing soccer, Torres got married fresh out of Pearl City High School. The next year, at age 19, she was ready to leave what she describes as an abusive relationship. Incensed, her husband accused her of stabbing him with a pair of scissors -- an injury she says he staged while she was in another room. They agreed to mediation on the military base where they were living, but her advocate did not show up and the mediator ruled against her. She tried to get a restraining order against her husband, but he beat her to it and she faced him in court alone. "I was by myself, representing myself," said Torres, who is now 26. "I didn't know what I was doing in court. I felt lost." For victims of domestic violence, having a lawyer by their side in court can be a lifeline, but the need far outstrips the supply of willing attorneys, according to Nanci Kreidman, executive director of the Domestic Violence Action Center. Often, her organization has to take a moratorium and stop taking cases -- an anguishing decision, she said. "It's terrifying to face your abuser in court," Kreidman said. "It's easy to just lose the courage and lose your voice. You need to have somebody who is able to be your voice and help you find your own voice to ensure your legal rights. Otherwise, you might be inclined to surrender in the face of the fear and the intimidation and the lack of familiarity with the system." Access to legal services not only helps people like Torres; it also is credited with reducing the overall incidence of domestic violence. A 2003 study in Contemporary Economic Policy found a significant link between the availability of legal help for battered partners and a long-term reduction in domestic violence. The Domestic Violence Action Center, formerly known as the Domestic Violence Clearinghouse, provided Torres a lawyer for her next court appearance, a custody hearing for Anjelina. But it was an uphill battle. The young mother had not documented her ex-husband's abuse, and the judge accepted his allegations and the mediator's findings and awarded him full custody. "We waited all day, and the judge only gave us 10 minutes," Torres said. "When I did my testimony, I was crying." Her ex-husband made all kinds of accusations against Torres, and the judge wound up ordering her into drug rehabilitation, anger management and parenting classes, plus a psychological evaluation. But substance abuse assessments made clear that she did not drink or use drugs, so no rehab facility would take her. She completed the other classes as quickly as possible in hopes of reclaiming her daughter. In six weeks her attorney persuaded the court to grant her supervised visits with Anjelina, but they were limited. Meanwhile, Torres' wages at her $9-an-hour clerical job were docked to pay her ex-husband's lawyer's fees. "I kept losing and losing," she said. "It was hard. My daughter was growing up." Several months later, family law attorney Ellen Politano, who donates much of her time through Volunteer Legal Services of Hawaii, took a fresh look at the case after hearing about it from an acquaintance. Politano, who used to be a prosecutor, pored through the case record and found the evidence against Torres questionable. "I really believed that she had been wronged," said Politano. "I believed that the military had not done a thorough job in terms of investigating the allegation that she had attacked him. I looked at the descriptions of the wound and the weapon, and if he's left-handed or right-handed, and it didn't match up. There was a lot of inconsistency." It was too late to reopen that issue. But when Anjelina's father asked the court to allow him to move from Hawaii and take his daughter with him, Politano objected strenuously and filed a motion for custody. The judge turned down both requests, a split decision of a sort. But shortly afterward, Anjelina's father violated the court order, moving to the mainland with her. Politano wasted no time, working all night on the case, and this time she prevailed in court. Torres was awarded temporary custody of her daughter. With donations from friends and co-workers, she pulled together enough money for airfare and took off for Connecticut, clutching her court order to reclaim Anjelina, then 2. The local police department accompanied Torres and staked out the perimeter of the house where Anjelina was staying with her father's girlfriend and their two kids. "The police detective showed me to the door and said, 'Ms. Torres, identify your daughter,'" she recalled, a sob catching at her voice. "I couldn't speak. ... She came to me." 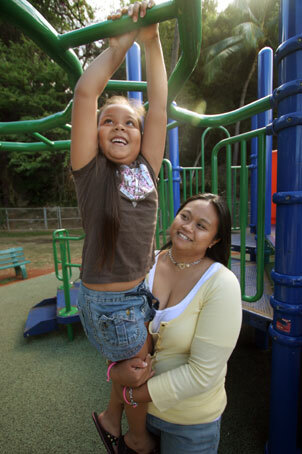 Sharma Torres and her 6-year-old daughter, Anjelina, play at a park near their apartment. After many setbacks, Torres won full custody of Anjelina, with help from Ellen Politano, a family lawyer who donated her time on the case. At the full-blown custody trial a few months later in Honolulu, the domestic-violence allegations against Torres were rebutted. The judge awarded her full custody of Anjelina. "It was the epitome of poetic justice," said Politano, who has become friends with Torres over the years. Politano, a single mother who donated more than 200 hours last year on pro bono cases, says she and many of her colleagues in family law feel an obligation to help. "It's more than just writing contracts and being on retainer for the bank and going to court," she said. "It's the little people, too. These people are entitled to lawyers." Torres and her daughter, now 6, share a studio apartment, where a soccer ball rests near the pink double bed. Anjelina, an active first-grader with a round face and ready smile, wears her waist-length hair high in a ponytail. Both she and her mother play on soccer teams these days. "There were times when I just wanted to give up, but Ellen kept fighting," Torres said, reflecting on her ordeal as her daughter zipped around on a scooter. "She fought for me. That's what lawyers are there for, being the voice for their client. And she was really good at it. I know how much time she sacrificed being away from her family and her friends and her life." "There are a lot of women out there who are in my situation, but they don't have the financial means to hire a lawyer and no lawyer is willing to help them," she added. "Without legal representation, I don't think I would ever have gotten Anjelina back."